We are often approached by our piano parents, wanting to know how to make practice “work” at home. Too many times, students discontinue lessons because home practice isn’t going smoothly. Piano practice can be a mystery to parents who have never themselves played an instrument – and even if they have, it’s likely they quit too early, and regret doing so. In our opinion, our students’ success boils down to solid home practice habits. Soccer practice? Pretty straight-forward… drop your children off at the field, cheer from the sidelines and when a great pass is made or a goal is scored, it’s obvious that they’re doing well. Dance practice? Again… drop your children off at the studio, peek through the viewing window and if they’re in sync with the rest of the class, it’s obvious that they’re probably doing well. But piano practice? Well that’s a different beast all together! Piano practice drop-off just doesn’t exist. 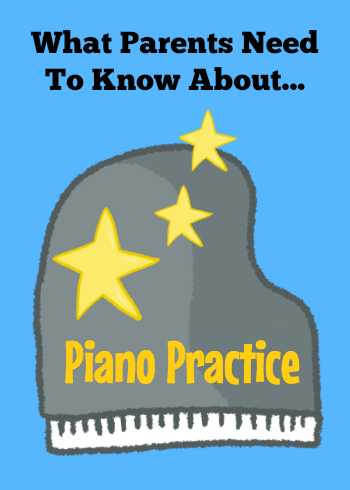 Read on for seven things parents should know about piano practice. 1. Your children will need help – Up until about age 11, children need hands-on help with home practice. And even though you yourself may not read music or play the piano, your assistance is still very much needed! Parental help can take the form of reading lesson notes, organizing practice time wisely, providing encouragement through difficult sections or situations, and seeking out answers for “I’m stuck on this” problems. Asking a young child to be in charge of something as important as piano practice is often asking too much. Your help at home will make a substantial difference in your children’s progress. 2. Your children need you to establish a routine – Piano practice that happens every single day is by far the most effective practice structure. 30 minutes three times a week is just 90 minutes. 20 minutes seven days a week is 140 minutes. The total difference is 43 hours of missed practice per year if your children are only at the piano three times a week! Short, focused and regular visits to the piano help your children retain and understand what they are learning while making the most of generally short attention spans. If practice is enjoyable, rather than arduous, your children will naturally (and unknowingly!) increase the time they spend on the bench. Setting a regular time of day when piano practice happens “no matter what” will ensure a daily practice routine is easy for your children to maintain. 3. Your children needs lots of encouragement – Learning to play the piano can be difficult; it can be discouraging… it can feel overwhelming. Your children (no matter what their age) need loads of encouragement. And not just verbal encouragement. You can show your children that you value their efforts by attending their recitals with enthusiasm, inviting friends and family to listen to your them play, and taking the time to sit and listen to them practice with your undivided attention. 4. Your children need a home instrument that is enjoyable to play – Much of the pleasure from playing the piano comes from one’s ability to emote feeling, nuance and expression through music. Even young beginners will experience great satisfaction from making beautiful sounds…. so choose an instrument that gives them the best opportunity to make beautiful sounds. Guidance from your children’s teacher will help you find an affordable piano (don’t worry, there are many great and affordable options) that will give your children the tool they need to truly experience piano lessons. An investment in a good instrument protects the investment you are making in your children’s musical education. 5. Your children need a positive practice environment – Aside from providing encouragement, your children need you to create a positive practice atmosphere. Help your children avoid “cramming” the day before lessons. Stick to your daily routine to avoid weeks of forgotten practice (which lead to feelings of inadequacy on the part of your children). Music is joyful… and so practicing music should be as well. This is, fortunately, something that you are able to create easily with a commitment to regular practice. 6. Your children need you to communicate with their teacher – Working as a parent/child/teacher triangle is the optimal way to ensure progress and success in piano lessons. Be sure to communicate often with your children’s piano teacher. Check in on how lessons are progressing, ask for help if something is difficult for your children at home, let your teacher know when practice weeks have gone extremely well (or not so well). Working as a team means your children are supported equally on all sides at all times. Learning to play music is a life-changing experience. And, as a parent, the process is a thrill to watch. Being a major part of this accomplishment is incredibly rewarding! The profound pleasure of being a “piano parent” far outweighs the required extra efforts; and this is, by far, the most important thing that piano teachers want parents to know about piano practice. Many thanks to TeachPianoToday for this content! Posted in Piano and tagged parenting, piano.